The Video Innovators S-100 is a shoulder rest for full-size VHS camcorders. 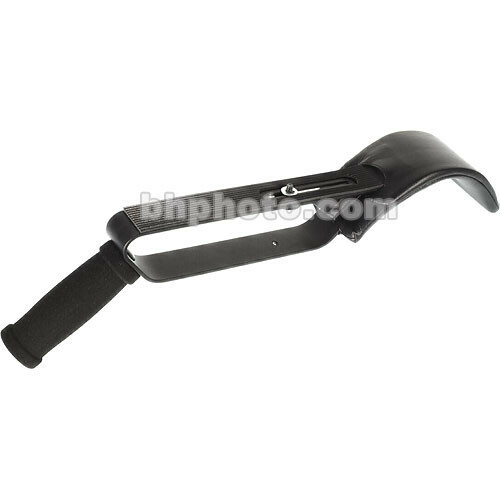 A shoulder rest with an ergonmic handle will give the user better control over camera movement and stability. This model offers a stepped-bottom for specific camera models. This model features an adjustment for camera position. Box Dimensions (LxWxH) 20.157 x 4.331 x 4.252"
S-100 Pro Shoulder Rest is rated 4.0 out of 5 by 1. Rated 4 out of 5 by Floyd de la Cruz from Can be more versatile in its design. It provides more stability that just holding the camera in your bare hands, However if the metal rest was longer and the shoulder mount curvature was dedeper and more adjustable for fit, it would be more versatile.